Wandering around Woodstown a few months ago, I relied, maybe a little too heavily, on my trusty copy of the WPA Guide to 1930s New Jersey. If anything old and interesting were to make itself known, it would likely be noted with a line or two, at least, in the mapped tour of Salem County. "...spread over several acres, stand rows of stock and storage barns. Each Tuesday morning throughout the year long caravan arrive with everything from ancient household utensils to livestock, all to be sold at Stoney's Auction. Everything is offered: fruit, battered furniture, the old cocked hat of some Revolutionary hero, hand made needle work, livestock on the hoof, and modern refrigerators. The auctioneer wears a 5 gallon hat and high boots into which his trousers are tucked. He snaps a 20 foot whip over the heads of cattle to center the crowd's attention. Thousands attend the auction in the course of each year." It's that kind of description that makes me wish that every copy of the WPA Guide came with a wayback machine, either to go back to the preceding Tuesday (if the auction was still there) or to 1938 (a Tuesday, preferably), when the writer had obviously checked it out. Even though I wasn't in the market for livestock, it sounded as if an afternoon at Stoney's was well worth experiencing. A drive down Main Street confirmed my suspicion: where once there had been a sign bearing a bull and the words "Stoney Harris Sales Co. Office," there was nothing but a series of pleasant-looking houses of older vintage. What happened to the auction? The pieces started coming together after I returned to Hidden New Jersey headquarters and did a little research. Knowing, as I did, that Cowtown had been operating nearby for quite some time, I wondered if it might have had some connection to the now-absent auction. As the guide stated, Stoney Harris had been operating very successfully in his Woodstown neighborhood for quite some time, augmenting the weekly sales with an annual rodeo in conjunction with the Salem County Fair. Popular as the auction was, it drew increasing numbers of people and traffic along with it, which the town tried to manage through ordinance. Frustrated, Stoney bought two farms on U.S. 40 in Pilesgrove and moved the entire operation there in 1940. And though he'd already left town, Stoney wanted to make one final statement about the way his business had been treated by the local government. 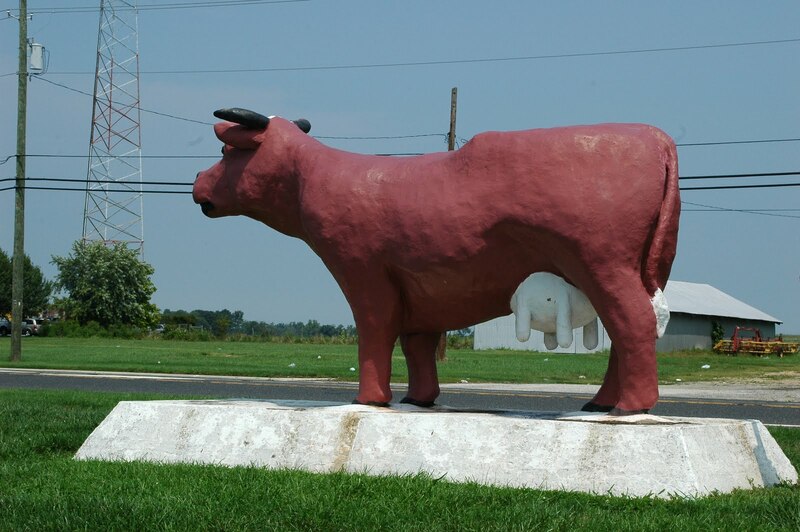 According to a descendant, once the auction was settled in its new space, Stoney erected a large statue of a cow on the property next to the highway, its back end facing Woodstown. Today the sales operation is billed as a farmers' market but sells many of the items you'd expect to see at a flea market, from apparel to used goods (vintage, anyone?) along with fresh meats, produce and plants. Come to think of it, today's wares don't sound that much different from what Stoney was auctioning in his day, except maybe now that "modern refrigerator" would be seen as a valuable antique. I wonder if that old cocked hat might show up on a vendor's table sometime?